Shazam! was released in the United States by Warner Bros. Pictures in RealD 3D, Dolby Cinema, and IMAX 3D on April 5, 2019. The film has grossed over $263 million worldwide and received praise from critics for Sandberg's direction and the performances of Levi and Grazer, as well as its light tone and sense of fun. A sequel is currently in development. At school, Billy saves Freddy from bullies and is chased into a subway, where Shazam magically summons Billy, chosen as the new champion. By calling Shazam's name, Billy is transformed into an adult superhero now endowed with the wizard's name; thanking Billy, Shazam the Wizard turns to dust, leaving behind his staff. Returning home, Freddy helps Billy explore the extent of his newfound powers: electricity manipulation, invulnerability, super strength, hyper speed, higher intelligence and flight. Freddy's videos of Shazam testing his powers become a viral sensation, and Billy begins skipping school to use his powers for money and fame in Shazam form. Seeing Champion Shazam save a bus on the news, Sivana easily defeats him and demands he surrender his powers, but he transforms back into Billy to escape into a crowd. From the news, Sivana deduces Billy's identity and abducts Freddy to find Billy. Jack Dylan Grazer as Frederick "Freddy" Freeman: Billy's foster brother and best friend, a disabled, nerdy superhero enthusiast who is the only person who knows that he is Shazam. Adam Brody as Freddy's adult superhero alter-ego. Faithe Herman as Darla Dudley: Billy's youngest foster sibling at his new home, an energetic and effusive little girl. Meagan Good as Darla's adult superheroine alter-ego. Grace Fulton as Mary Bromfield: Billy's foster sister at his new home, the "den mother" who helps take care of the other kids and is debating attending college in California. Michelle Borth as Mary's adult superheroine alter-ego. Ian Chen as Eugene Choi: Billy's foster brother at his new home, an obsessive gaming enthusiast and budding techie. Ross Butler as Eugene's adult superhero alter-ego. Jovan Armand as Pedro Peña: Billy's foster brother at his new home, a shy, sensitive kid who has trouble opening up. D. J. Cotrona as Pedro's adult superhero alter-ego. Marta Milans as Rosa Vasquez: The foster mother of the group home where Billy and his friends live. Cooper Andrews as Victor Vasquez: The foster father of the group home where Billy and his friends live. Principal photography for Shazam! began in Toronto and Hamilton, in Ontario, Canada on January 29, 2018, under the working title Franklin, and was scheduled to wrap by mid-May 2018. The film was set primarily in Philadelphia, Pennsylvania and firmly established within the DCEU. Most of the production was shot at Pinewood Toronto Studios and also several public locations around the city, including the University of Toronto, Woodbine Shopping Centre and Hearn Generating Station. In early March 2018, filming took place at Fort York National Historic Site in downtown Toronto. By early May 2018, Asher Angel, among other young cast members, had finished filming his part. Principal photography wrapped on May 11, 2018. Additional photography took place in Toronto between November and December 2018. Shazam! had a filming budget of only $80–90 million (and about $100 million once post-production was complete), making it the cheapest DCEU film to-date. Footage of the skyline and aerial shots, as well as other location work, were filmed in the city of Philadelphia in December 2018. As of April 16, 2019[update], Shazam! has grossed $99.5 million in the United States and Canada, and $164.1 million in other territories, for a worldwide total of $263.6 million. As of April 16, 2019 the film broke even and has made a profit of $6 million. In the United States and Canada, Shazam! was released alongside The Best of Enemies and Pet Sematary, and was projected to gross $40–50 million from 4,260 theaters in its opening weekend. Two weeks before its release, the film grossed $3.3 million from Fandango advance screenings, higher than the $2.9 million made by fellow DCEU film Aquaman the previous December. It then made $5.9 million from Thursday night screenings, for a combined preview total of $9.2 million. The film grossed a total of $20.5 million on its first day, including Thursday previews. It went on to debut to $53.5 million, finishing first at the box office. In its second weekend the film made $25.1 million, retaining the top spot. At the review aggregator website Rotten Tomatoes, the film holds an approval rating of 92% based on 335 reviews, with an average rating of 7.31/10. The website's critical consensus reads, "An effortlessly entertaining blend of humor and heart, Shazam! is a superhero movie that never forgets the genre's real power: joyous wish fulfillment." On Metacritic, it has a weighted average score of 71 out of 100, based on 52 critics, indicating "generally favorable reviews". Audiences polled by CinemaScore gave the film an average grade of "A" on an A+ to F scale, while those at PostTrak gave it an overall positive score of 83% and a 61% "definite recommend". Writing for The A.V. Club, Ignatiy Vishnevetsky gave the film a "B−" and said: "But while the story of an extremely overpowered champion rising to challenge a one-dimensionally sinister baddie might seem like the epitome of simplicity, Shazam! is still a modern-day tentpole blockbuster, overburdened with backstories for both hero and villain and subtexts that it can't (or won't) fully articulate". That publication followed up with a further consideration of masculinity in the film and the superhero genre generally by focusing on the transition of Billy Batson from an adolescent boy to a man with power and responsibility. Benjamin Lee of The Guardian gave the film 3/5 stars, wrote "The finale, while admirably self-contained and small-scale, grinds on for far too long, a boring escalation of anti-climaxes that cumulatively dull the intended emotional impact. It's a film in need of a tighter edit with a script in need of a sharper polish, an imperfect franchise-launcher that nonetheless represents significant progress for DC". ^ McNary, Dave (April 12, 2019). "'Shazam!' Heads for Another Box Office Victory as 'Little' Looks Bigger Than 'Hellboy'". Variety. Retrieved April 15, 2019. ^ a b "Shazam! (2019)". Box Office Mojo. Retrieved April 17, 2019. ^ Verhoeven, Beatrice (2019-04-04). "'Shazam!' 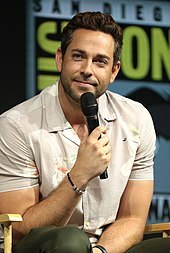 Star Zachary Levi Was Cast After Director David F Sandberg Saw 'Over 100 People' (Video)". www.thewrap.com. Retrieved 2019-04-06. ^ Checcini, Mike. "How the Shazam Movie Brings Magic to the DCEU". Den of Geek. Retrieved 2019-04-06. ^ a b c d e Bentley, Jean. "Surprise! Your Fav "OC" & "Riverdale" Alums Are In "Shazam"". www.refinery29.com. Retrieved 2019-04-06. ^ David F. SandbergVerified account. "David F. Sandberg on Twitter: "The wizard is named Shazam in the movie, I just think theyâ€™re trying to avoid confusion in news/articles.â€Ś "". Twitter.com. Retrieved 2019-04-05. ^ "Smallville's John Glover Reveals His Secret Shazam! Role". CBR. 2019-03-10. Retrieved 2019-03-27. ^ "Credits | Andi Osho". Retrieved 2018-11-02. ^ 4. "DISCUSSION: Was "Shazam!" not set to feature a character from "Lights Out" in an Easter Egg Cameo Appearance? : DC_Cinematic". Reddit.com. Retrieved 2019-04-05. ^ Ramos, Dino-Ray (2019-04-05). "'Shazam!' Director David F. Sandberg Talks Going Horror To Superhero And Bringing Inclusivity To Family Narrative". Deadline Hollywood. Retrieved 2019-04-06. ^ "David F. Sandberg on Instagram: Let's go!⚡️". Instagram. Retrieved 29 January 2018. ^ "Shazam Budget Reportedly $80-$90M; Suits Didn't Cost $1M". ScreenRant. 2019-01-19. Retrieved 2019-01-30. ^ Allen, Nick. "Shazam! Movie Review & Film Summary (2019) | Roger Ebert". www.rogerebert.com. Retrieved 2019-04-10.